MALVERN, Pa., and WEST LAFAYETTE, Ind. — Signals, an innovative early intervention system that warns students that are at-risk of underperforming in a course and facilitates faculty interventions, will be enhanced and brought to higher education institutions through a joint effort by SunGard Higher Education, Purdue University and the Purdue Research Foundation. 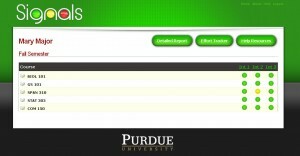 Developed by Purdue, the Signals software monitors students’ behavior patterns and academic performance to determine if they are at risk of earning a low grade and allows faculty to intervene with suggestions on actions they can take to help students improve their grades. An intuitive stoplight provides indications to students if they are underperforming and prompts the students to take action. Today, campus sources for data about students vary greatly and come from different systems, applications and vendors. The power of Signals’ predictive modeling comes from employing multiple data sources to create a more complete picture of a student’s academic performance. That picture helps identify students at risk in a course so an intervention can happen early enough to actually make a difference – as early as the second week of class. Officials from Purdue University, the Purdue Research Foundation and SunGard Higher Education signed a memorandum of understanding outlining key points of the parties’ collaboration efforts and have begun work on a definitive agreement. Their planned efforts will bring Purdue’s original design and expertise together with SunGard Higher Education’s development resources. SunGard Higher Education will create and market a new next-generation software product based on Signals that will be architected to work with multiple course management systems and student information systems. The solution also will provide flexibility for institutions so that they can refine and customize it to fit their needs and environment. Signals was piloted in the 2006-07 and 2007-08 academic years. According to Purdue, the pilot involved nearly 2,000 students, where a double-blind study found that 67 percent of students receiving a yellow or red warning improved their effort and grade. For students who received a red light only, 78 percent improved their grade and effort during the mid-term period.